EA is sending out Titanfall alpha trial invites to select Xbox One users. In news that should excite Xbox One shooter fans, EA is sending out alpha invites for Respawn Entertainment's upcoming shooter, Titanfall. Multiple users on gaming forum NeoGAF have confirmed to have received an invite and it directs to the official Titanfall website. However, the email itself doesn't guarantee you'll get to play Titanfall early, since it also states, "If you are selected to take part in our upcoming test, you will receive an email in the coming weeks with a unique code and instructions on how to download and access the game on Xbox One." 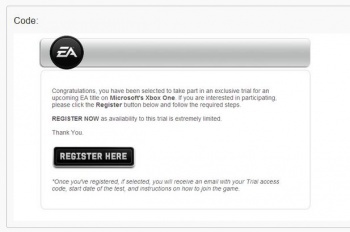 While initially believed to be a scam due to the email citing an "alpha trial," which doesn't sound right with the game set for release in less than two months, a customer support rep for EA has confirmed that this is indeed legitimate. For now, it's still uncertain whether non-Xbox One owners will be getting emails as well, or if this is exclusive to the Xbox One platform. Make sure to check your email address where your Origin account is registered to see if you got one. In the meantime, go check out the limited edition Titanfall-themed controller coming to the Xbox One, and read up on why Respawn thinks their latest shooter will be tough to market since it doesn't have a single-player mode. We've reached out to EA for an official statement and will update the story once they've replied. Titanfall will shoot out to retail on March 11 for the PC, Xbox 360 and Xbox One.